** If you'd like to learn more about tracking pixels please refer to our dedicated support article: How to track conversions? 1. Log in to your Livestorm account. Go to Settings > Integration > Custom code. You can just paste your custom code between script tags for instance. Choose if you want to add the tag on your registration pages and/or your company page. You can even tell Livestorm if you want to have it automatically set up for each new webinar you create. 2. Last but not least, go back to your specific webinar > Webinar Settings > Integrations and make sure that your custom code is enabled for that webinar. 🚨Import note: integrations you set up will be disabled by default for your previously created webinars. 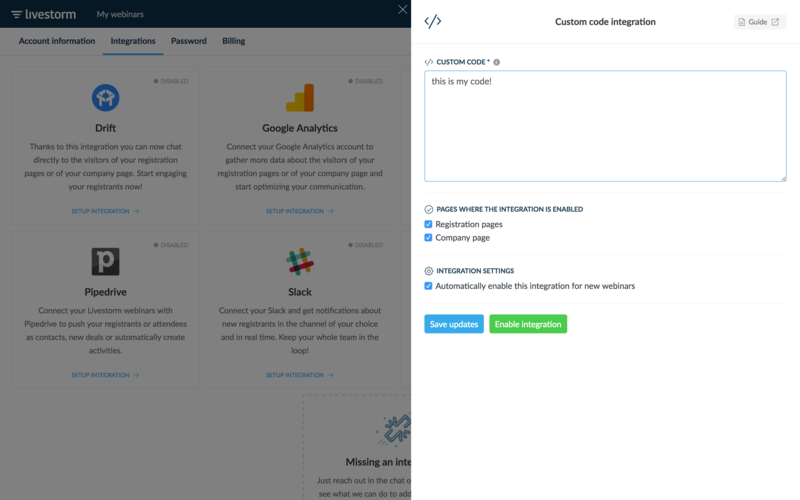 If you want to enable the integration for a previous webinar, just go to the webinar settings page and enable it under "Integrations". How to Track Conversions on My Registration Pages?